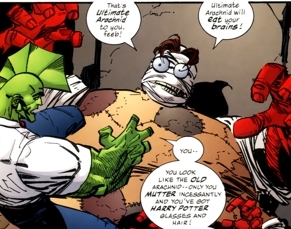 Other Distinguishing Features: Ultimate Arachnid is covered over most of his body but his arms, including four smaller appendages, are visible and red colored. One of the Creator’s creations was Ultimate Arachnid, an overweight monster who was one of a group based on existing superhumans. The Dragon stumbled across this group of freaks while being given a tour of the under-construction Chicago, following the fall of CyberFace. In the resulting fight, Ultimate Arachnid and his companions were all killed while protecting the Creator from his own falling headquarters.